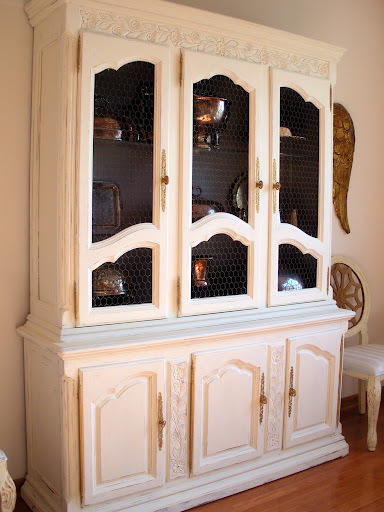 Finally finished the china cabinet "bibliotheque" transformation! 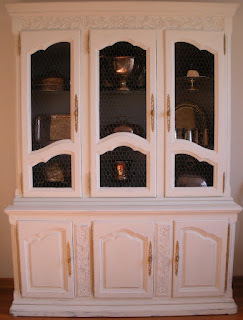 I know, I know...this is the third cabinet I have painted for the Dining Room...but this time I intend to keep it! We call it "Jenny's Cabinet", in honor of our beloved little helper who passed away last month. 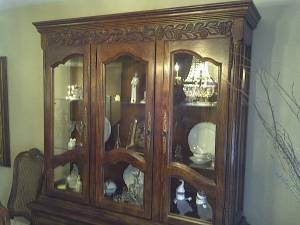 The original china cabinet had glass doors and glass sides. Fifty dollars on Craigslist! Here you see my beloved assistant, Jenny. 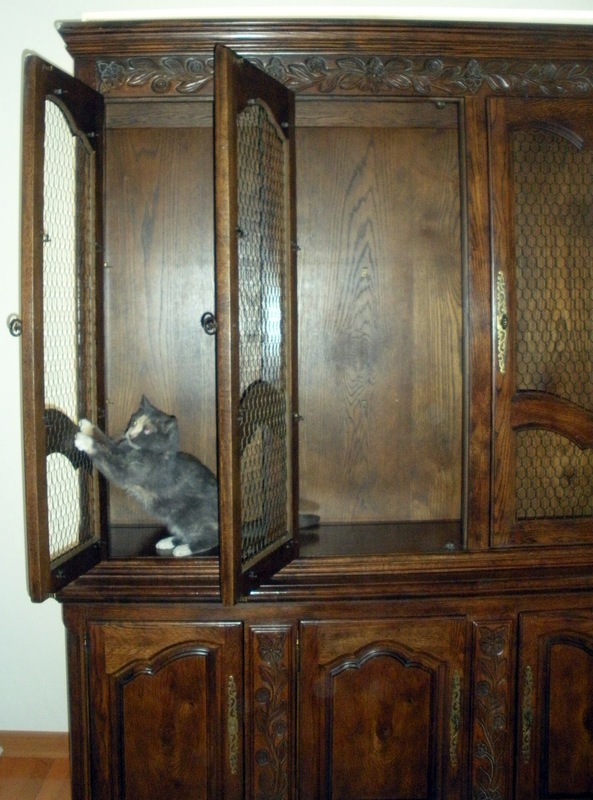 Original Craigslist photograph...you can see the side glass panels. The bibliotheque I fell in love with. It cost more than my car. 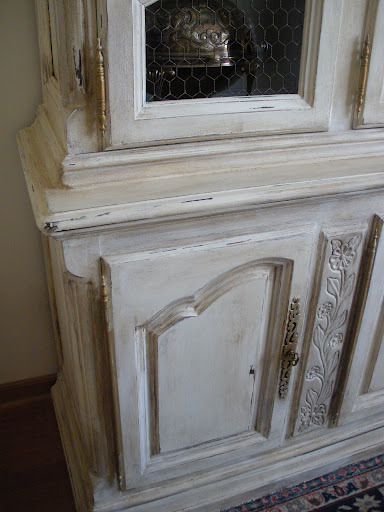 One coat of Annie Sloan Pure White and a second Coat of Annie Sloan Old White, even over the glass side panels. A coat of Clear Wax, then a coat of Dark Wax. Here, you see the "bibliotheque" before and after the wax application and sanding. Detail of painted and waxed finish. Another closeup. 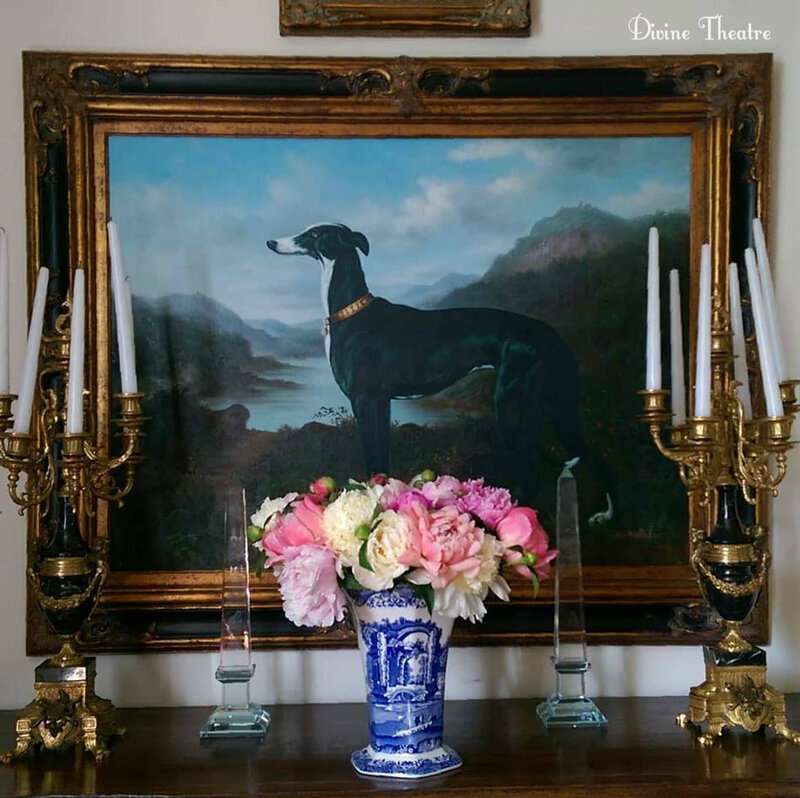 The interior was painted with Annie Sloan French Linen. We call it "Jenny Grey". 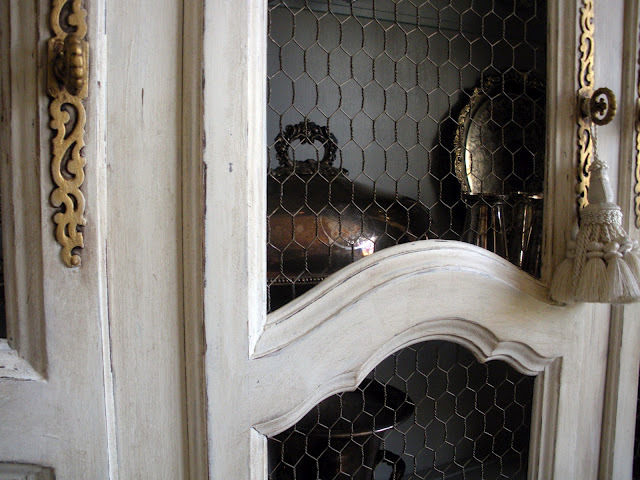 Closer view of the door panel with the Dark wax. 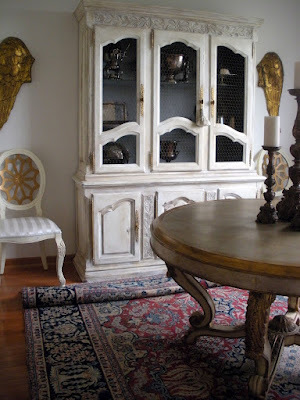 When I "age" a piece, I consider how it was used and the manner in which is was cleaned. The wax polish would have accumulated around the handles and pulls, the base would be marred from mopping and moving the piece, etc. Any ideas on how to get the rug under the cabinet without killing ourselves? 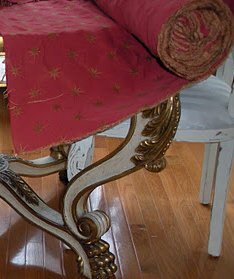 Today I will be reupholstering the chairs with a salmon colored fabric with gold starbursts by Kravet...Craigslist STEAL! 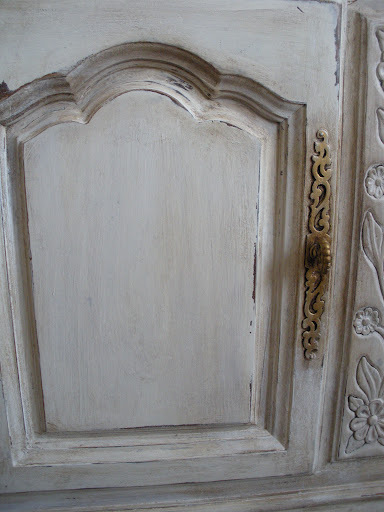 I am participating in Shades of Amber Chalk Paint Linky Party! Two lift buddies! I swear by this little tool! 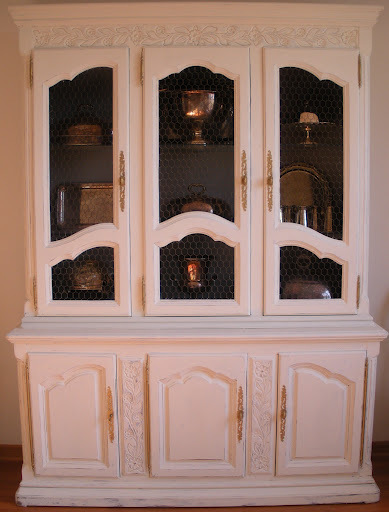 Love the Jenny cabinet. The "two lift buddies" sounds good, but I tend to think the rug would look better turned the other way. Plus, the lovely cabinet will not crush the pile. 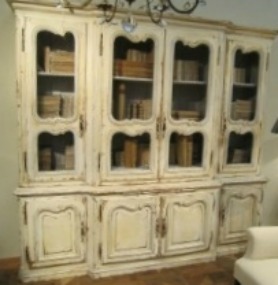 The cabinet is absolutely stunning! Good work, as always! Interestingly, never saw anyone paint over glass with ASCP before. Trust Andie, to come up with the unique! I like yours much better - great job !! I bet Jenny is honored you named the color after her. 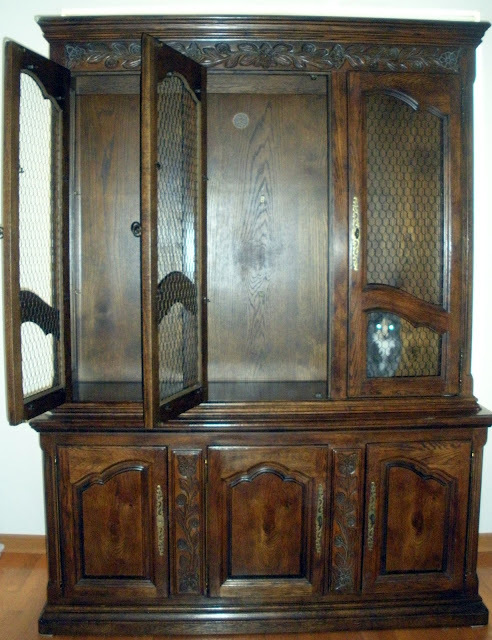 :) I agree with what someone else commented on - if the cabinet is as heavy as it looks, it will crush the pile in the rug. Andie I love “Jenny’s” cabinet it’s so beautiful! 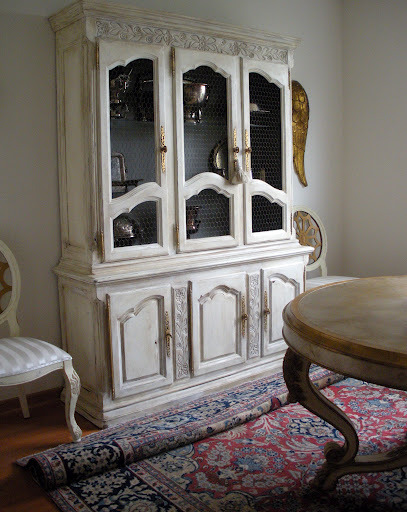 While your cabinet might not be everyone’s taste you made your cabinet look updated and fresh. You got exactly what you wanted for a nominal price so I wouldn’t worry what one sour person has to say. Personally I would have done the same thing to that cabinet it looks better now. I have to agree with the person above depending on your dining room direction turn the carpet so it isn’t adding heft to the cabinet. Enjoy your weekend Andie and I can’t wait to see your chairs! Andie a beautiful job, a complete transformation! 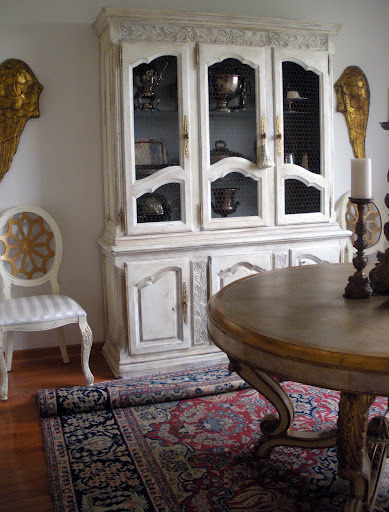 Those stools are amazing with the lovely gilding! OK...I just gotta tell you. Our Craigslist does not have this kind of stuff! There is never anything this good and believe me I have looked. Great job on the transformation. Do you use the wax brush or do you apply with a rag? Just curious because it's such a big piece. Beautiful job Andie. I love your new blog background too. So very you. Oh wow what a difference a can of paint and wax can do. Great job, I would say with the rug problem you may need to made a few new friends with good backs. Andie, I love the Jenny Gray and the beautiful fabric!